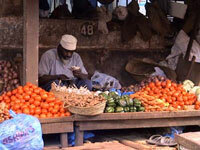 A vibrant array of colours and spicy scents lures visitors to the vibrant Central Market in Stone Town. Opened in 1904, the numerous stalls run over with tropical fruits, exotic spices, brightly coloured khangas (worn by local women) and rare provisions such as pomegranates and red bananas. Locals come daily from the surrounding areas to display their subsistence wares, and fishermen display their catch of the day with a pungent array of fresh fish from huge marlins to salty sardines. The market is chaotic and can prove a bit overwhelming for some people, but it is an exciting, colourful cultural experience and worth a quick stroll at least. Foodies will enjoy sampling the rare fruits and local specialities. Speaking of food, the best place for a sampling of traditional street food is the night market by the waterfront of the Forodhani Gardens.